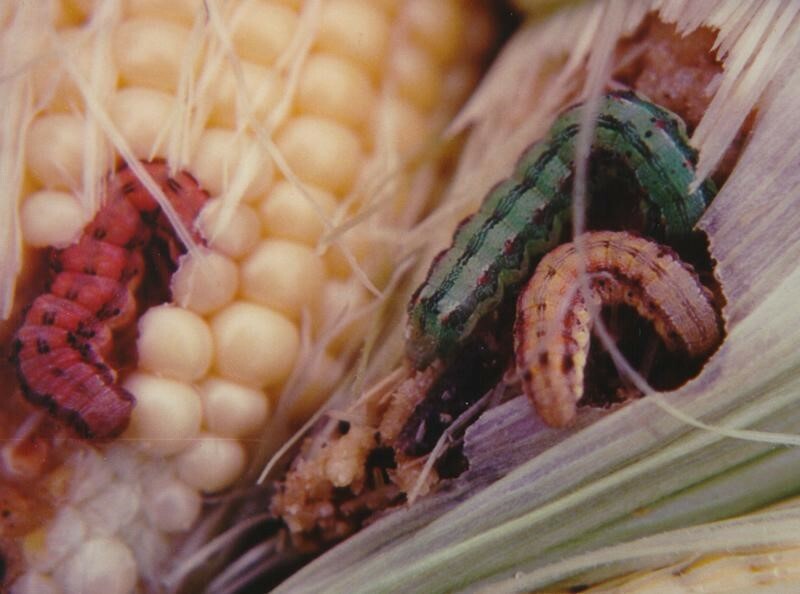 Have you seen corn borer or corn earworm this year? 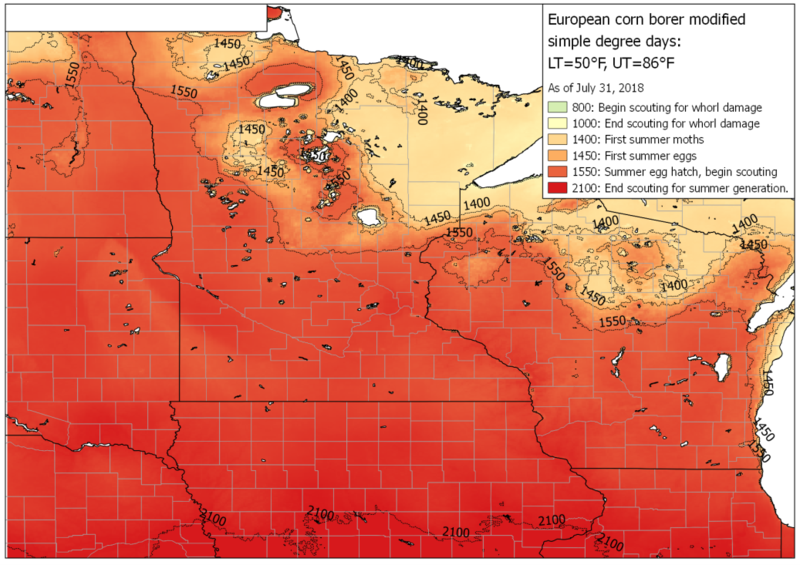 UMN Researchers give recommendations, and explain how they use flight data on European Corn Borer and Corn Earworm to help predict the risk of infestation. Fig. 1. European corn borer, ear feeding. European corn borer (ECB), Ostrinia nubilalis, can cause damage to sweet corn by tunneling through the stalk, ear loss by shank feeding, and tunneling through the ear along with direct feeding on ear kernels (Fig. 1). In most years, the primary concern is feeding damage within the ear, reducing marketability to both fresh-market and processing sweet corn. The multi-generation strain of ECB typically has two generations in Minnesota. 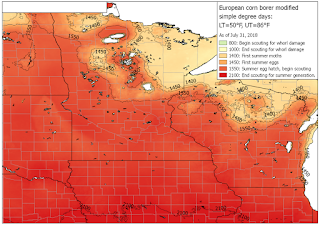 Given the number of above-average temperatures this summer, we are at ~225 ECB degree-days (>50F) ahead of 2017, for many locations; as of July 31, >1500 degree-days have accumulated for southern, central and NW MN (Fig. 2). It’s now time to review moth flight data or scout for second generation egg masses. The first 2nd generation moths were caught this week at Rosemount (2/trap/night). Last year's fall survey for ECB in Minnesota (field corn) again confirmed ultra-low larval populations entering the over-wintering period. In addition, cumulative moth counts for all black-light traps in the MN network have remained historically low, with nightly catches ranging from zero to 4 per night (see VegEdge: https://www.vegedge.umn.edu/moth-data/ecb-info). At such low moth numbers (<10 moths/night) we do not consider this a significant risk to sweet corn. For example, at Rosemount (Dakota Co.) where we have maintained non-Bt sweet corn “sentinel plots” to monitor for ECB ear damage, we have only had one hybrid reach a 5% ear infestation level during the past 6 years (e.g., May-June planting dates). Nearly all hybrids had zero ear infestations, with no insecticide applied. If moth counts for the 2nd generation flight exceed 10/night for 3 consecutive nights, then scouting for egg masses and/or hatching larvae would be warranted. The later planting dates should be watched more carefully, not only for ECB but also for our typical late-season flights of corn earworm. Fig. 3. Corn earworm ear feeding. Corn earworm (CEW), Helicoverpa zea, can also be found feeding on ears at this time of year. While the species cannot overwinter in Minnesota, it migrates from southern states and moth flights have been present, again at low numbers, across the state in June and July: (VegEdge: https://www.vegedge.umn.edu/moth-data/cew-info). CEW larvae can range in color (Fig. 3). CEW larvae do not typically bore into the ear like ECB, but if not managed, the slightly larger larvae (>1” when full-grown) will consume 10-15 kernels / larva during larval development. CEW moths also lay most of their eggs directly on fresh silks, and once the eggs hatch (4-6 days in summer), the larvae quickly enter the ear tip, where insecticides are no longer effective. Therefore, scouting is typically not feasible, and insecticide spray timing is often based on moth counts from pheromone traps (e.g., ‘Scentry’ or ‘Hartstack’ trap, with ‘Hercon’ lures, recommended; see resources, below) while fresh silks are present. The goal is to protect the newly emerging silks and ear, with protective insecticide applications, to prevent larvae from entering the ear. Although some CEW resistance to the synthetic pyrethroids has been observed in recent years, these are still good products to begin with (at the high field rates); see the Midwest Vegetable Production Guide for 2018 (below) for all labelled insecticides for sweet corn, and review the labels for current Pre-harvest intervals (PHI). One alternative that can help with CEW suppression is Coragen. We also recently completed research confirming that Minute Pirate Bug (Orius spp.) is commonly present in MN sweet corn (particularly on silk tissue), and is an effective predator of CEW eggs laid on silks. 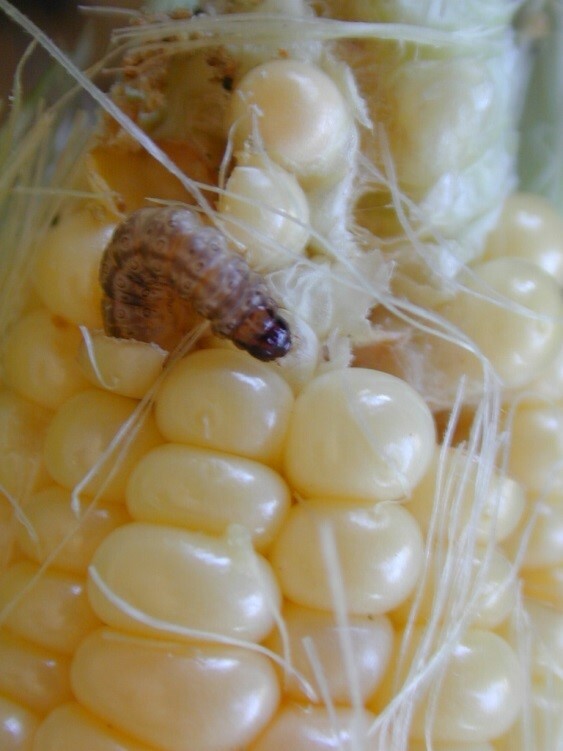 However, Orius will be more active in Bt sweet corn fields, where less insecticide is used. Treat vulnerable corn (row tassel to 100% silk) with an effective CEW insecticide, reapplying every 4-6 days until brown silks appear. *Morey et al., CEW pest profile, VegEdge. Morey, A., E.C. Burkness & W.D. Hutchison. 2015. Corn Earworm pest profile, sweet corn. VegEdge. Corn Earworm Moth Flights, VegEdge. 2016-2018. Degree-day Updates for ECB, Selected Insect Pests. 2018. Midwest Vegetable Production Guide for Commercial Growers. 2018.